The Cloncurry Parrot (Barnardius zonarius macgillivrayi, formerly Platycercus barnardi macgillivrayi) is native to North-western Queensland, adjacent eastern area Northern Territory in Australia. Cloncurry Parrot is a member of the genus barnardius, along with the Mallee Ringneck, Port Lincoln Parrot and the Twenty eight Parrot. These parrots all have a green body and a yellow ring or collar around their necks and are referred to as Australian Ringnecks. The Cloncurry Parrot is the smallest of the Australian Ringnecks, averaging 13 ins (33 cm) in length and 4.3 to 4.8 ounces (120 - 135 g) in weight. 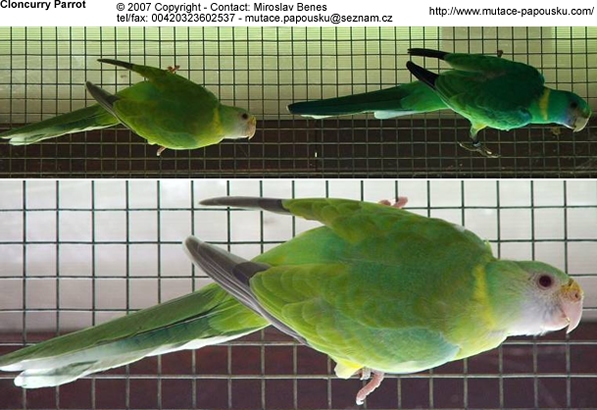 This parrot looks similar to the Mallee Ringneck Parrots, but is generally paler green also extending to back and lower back. Cheeks and lower ear-coverts bright pale blue; broad pale-yellow band to abdomen; lesser wing-coverts green; forehead pale yellow-green; and, as previously mentioned, is smaller. 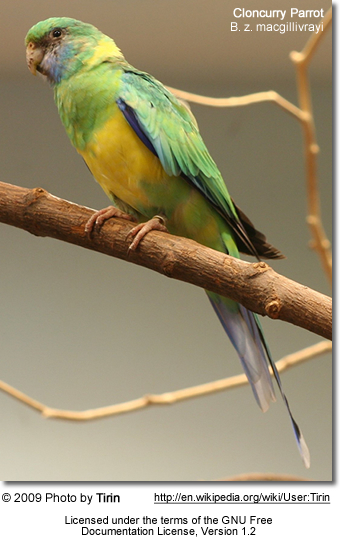 Several striking mutations have been bred in aviculture. Please refer to below photos. The Cloncurry is probably the least aggressive of the Australian Ringnecks, and yet they are sufficiently aggressive to best house them one pair per aviary. The minimum aviary size should be about 10 feet (3 meters) in length and 3 to 3.5 feet (about one meter) wide. Double wiring between each aviary flight is necessary. Non-toxic leafy branches can be placed in the aviary for the birds to chew up. This will entertain the birds and give the birds some beak exercise. Natural branches of various diameters, and placed at various angles, make great perches. The Cloncurry Parrot requires a quality parrot seed mix along with a variety of fruits, green leafy vegetables and vegetables. Seeding grasses and green can be offered. Sprouted or germinated seeds are usually more easily accepted by "seed addicts" than fresh fruits and vegetables. They usually prefer to breed in hollow logs. Sturdy logs should be offered. The length of a nest box / log should approximate 24 inches with an internal diameter of about 5/6 to 8 inches. The suitable internal diameters of a nest box about 7 inches square. The inspection hole should be around 4 inches (square or round). A removable top / lid is recommended for easy inspections and for cleaning. The best location for the nest box / log is high in the covered part of the aviary, but not too close to the roof to be affected by heat from the roof in the summer months. They generally produce one clutch per year, with about 4 eggs each clutch. Both the male and female incubate the eggs for about 20 to 21 days. The young stay in the next box for about 5 weeks and are independent within another 2 to 3 weeks. .